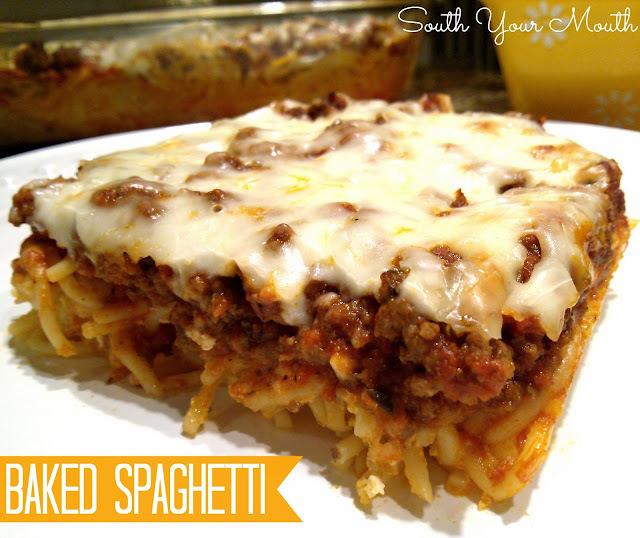 A baked spaghetti recipe that's a cross between spaghetti and lasagna (sometimes called spaghagna or spasagna). When the onions were younger, I made half-batches of this all the time because when I’d make spaghetti, we always had leftovers. Now that they’re bigger, they eat more so I rarely have leftover anything. As a matter of fact, we’re now in that zone where I often don’t have enough of whatever weeknight meal I've made and I end up eating a kid-sized portion to make it stretch (not that I couldn't stand some breathing room at the trough). Anyway, it’d been a long time since I’d made one of these so I decided to make it for supper this weekend. And because the onions apparently have the memory of a gnat, they couldn't remember ever having it and thought it was something new and special and got all excited about it. Suckers. I think this is a cross between spaghetti and lasagna. A spaghagna, if you will. Or spasagna. Or whatever. Let’s just call it baked spaghetti. Because that’s easier to say and doesn't make my head hurt. Cook ground beef with onion in a large skillet over medium-high heat until meat is cooked through, seasoning with salt and pepper to taste. Drain off fat then stir in spaghetti sauce; set aside. Combine ricotta cheese, egg, milk, parmesan, salt, garlic and oregano in a large bowl and stir well; set aside. Meanwhile, cook spaghetti per manufacturer’s instructions for al dente preparation in liberally salted water. I break the uncooked noodles in half to make things easier to prepare and serve later. Drain pasta well and add to ricotta mixture; stir to combine. Spray a 13x9 baking dish with cooking spray then spread pasta mixture evenly over bottom of dish. Top pasta evenly with meat mixture. Top meat mixture evenly with mozzarella cheese. Bake, uncovered, for 30-45 minutes at 350 degrees or until bubbly and cheese starts to brown. Is there something else aside from Ricotta I can use? You could probably substitute cream cheese. I use cream cheese and it is delicious. I've used cottage cheese and it works just fine - not that fond of cream cheese in this family for things like this. i use small curd cottage cheese.. When not using ricotta, like for lasagna, you can use cottage cheese and egg mix well and you cannot tell the difference, it is delicious and I am sure it will work well In baked spaghetti- not cream cheese!! I use cream cheese and sour cream. Cottage cheese would be a lot closer to ricotta than cream cheese. Granulated garlic is fresh garlic which has been dehydrated and milled into granules. Thank you! Glad there are folks out there that actually do get my sense of humor! I wonder sometimes! You mentioned on FB about freezing 1/2 of this. Any changes or just freezer? Thanks!! If I am short a bit on the spaghetti sauce can I add 8 oz tomato sauce to extend it? I loved this recipe! It was easy to follow and tasted great! I had it as left overs twice and it was just as yummy. This is a continuous favorite for our family (extended, too!). Just made it again tonight, per hubby's request. Thank you for this gem! One of my favorite sites. I love to visit here. Thank you for the recipes and the friendly, approachable way of writing. Feels like I've been in your kitchen having coffee with you.